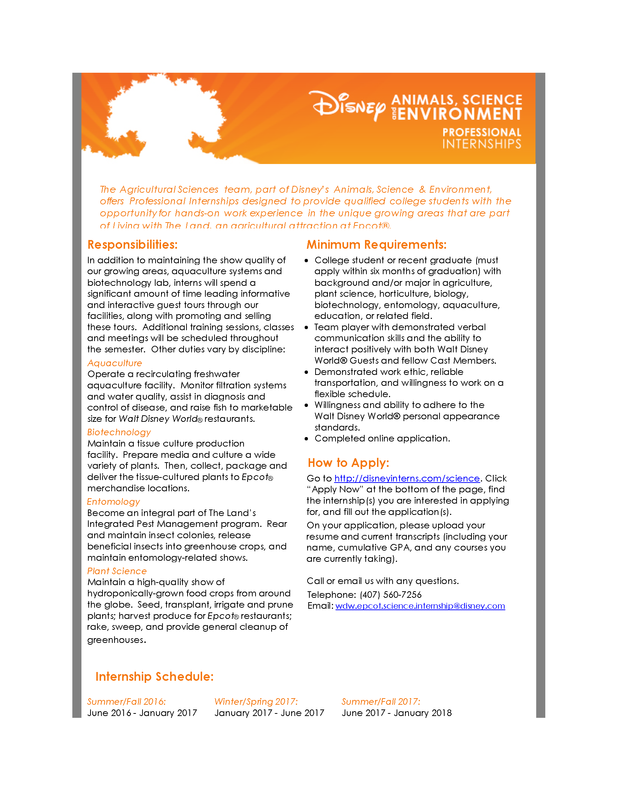 The Agricultural Sciences team at Walt Disney World in Orlando is looking for undergraduate college students and recent graduates who have received their Bachelors’ degree within 6 months of our internships’ start dates to participate in our fun and challenging six-month hands-on internship in several different agricultural and science education fields including Plant Science, Entomology, Biotechnology, and Aquaculture. We are currently looking for students to fill internships for the Fall 2019 term (June 2019 – January 2020). Desired majors include but are not limited to: Ag. Communication, Ag. Education, Agribusiness, Agriculture, Agronomy, Aquaculture, Aquatic Biology, Biology, Biotechnology, Botany, Crop Science, Biological and Biosystems/Agricultural Engineering, Entomology, Environmental Horticulture, Fisheries, Food Science, Horticulture, Landscape Design, Marine Biology, Microbiology, Molecular Biology, Ornamental Horticulture, and Plant Science. 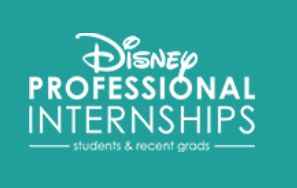 Interested students should apply online, http://www.disneyinterns.com/science, and should attach their cover letter, resume and school transcript to their application. 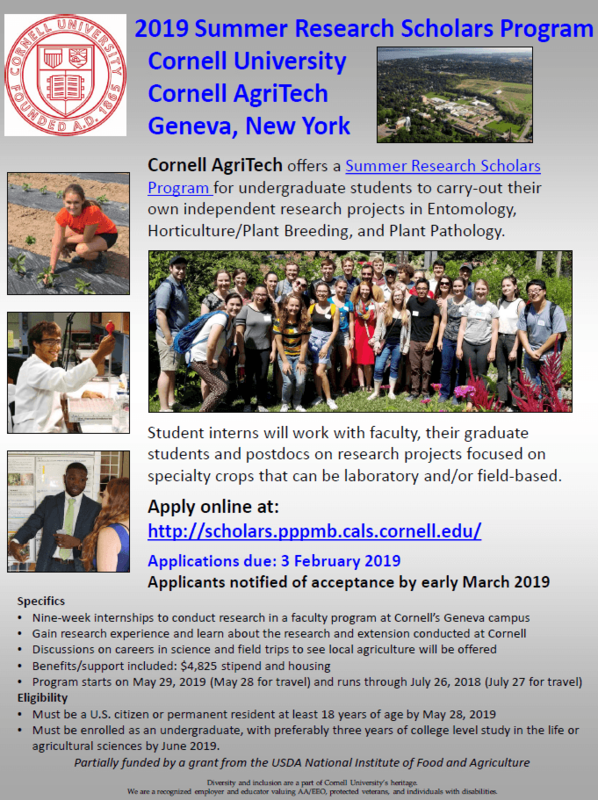 Click on “Enter Job Title or Keywords” then do a keyword search for “Agricultural Sciences” to view internship postings about the Plant Science, Entomology, Biotechnology, and Aquaculture internship positions along with many other science related internship openings. Selected students will be interviewed via phone to further discuss the internship. 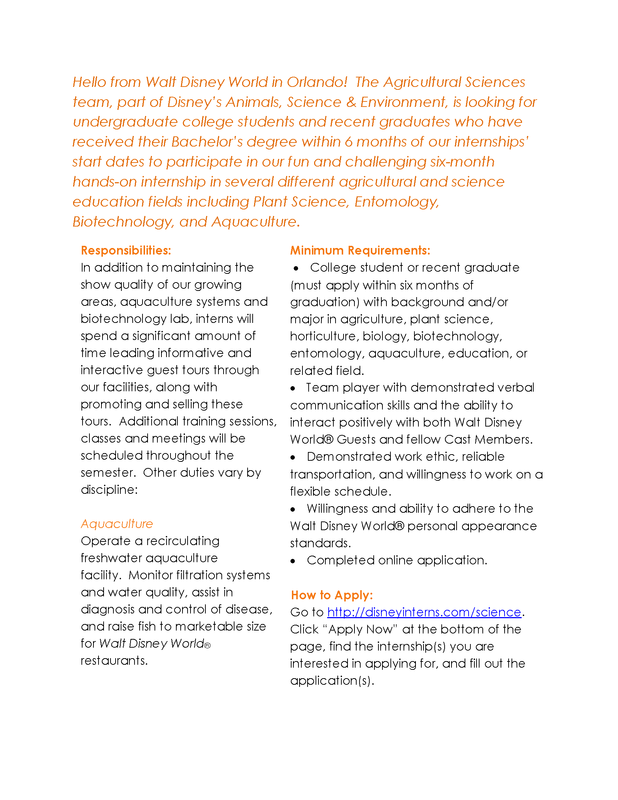 If you have any questions with accessing the site, please email us directly at WDW.EPCOT.Science.Internship@disney.com. 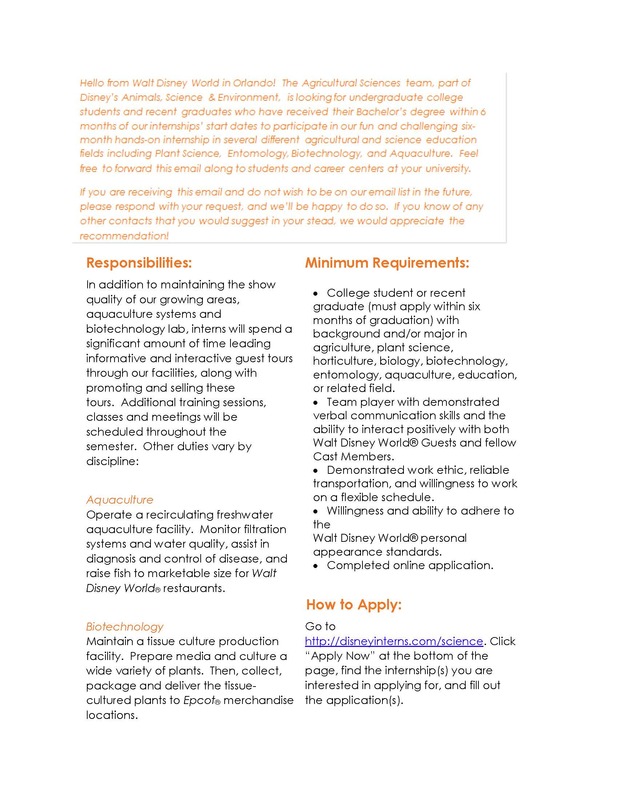 Internship opening for a student interested in working on various projects associated with ornamental production and management throughout the mid-Atlantic. Projects may include work with beetles in nursery production, greenhouse management of mealybugs and potential work with landscape pests. Intern will gain experience working with trees as part of demonstration plots regarding borers of ash trees and other outreach events. Intern will present a brief presentation about one of the insect pests encountered during the summer to the green industry. Preferably, applicants should have experience with entomology and Integrated Pest management but is not necessary. Necessary requirement is eagerness/enthusiasm to learn about entomology and IPM, willingness to work with and handle insects, and a desire to improve their skills or experience to better prepare them for their future career. Internship is from 1 June through 15 August. The pay is $12/hr. Longwood Gardens is seeking a self-motivated, dynamic individual for the position of Integrated Pest Management (IPM) Technician in the Horticulture Department. Primary responsibilities include assisting the IPM Specialist by scouting, diagnosing, treating, and training staff on plant health care issues and evaluating cultural, biological, mechanical, and chemical control strategies to reduce pests to tolerable levels across all areas of the conservatory, greenhouses, outdoor gardens and natural areas. This work requires a thorough understanding of horticultural practices, plant-pest interactions, control techniques and application equipment. This individual will conduct large tree sprays and other pesticide applications throughout the property, help train and direct the IPM team (staff, students, volunteers, and contractors) and assist with the management of all aspects of Longwood Gardens’ pesticide safety program. 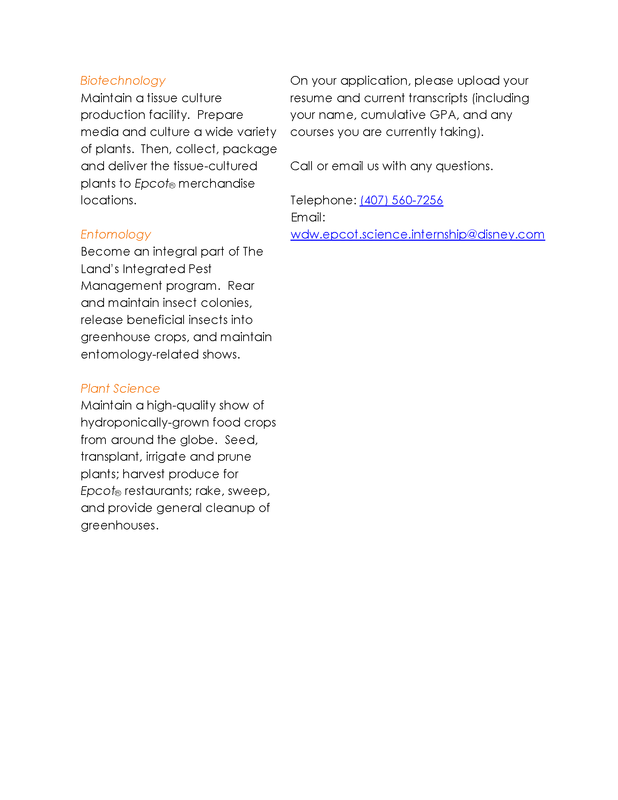 Minimum of an Associate’s degree in entomology, plant pathology, or horticulture equivalent with two years’ experience working in landscape and/or greenhouse horticulture with special emphasis in pest management scouting, diagnosis, and treatment of a variety of ornamental plants is required. Must have or be willing to obtain a Class B commercial driver’s license and a PA Pesticide applicator’s license. The successful candidate will possess good time management, organizational, and observation skills with strong attention to detail; fluency with Microsoft office, and strong communication skills with the ability to present to diverse audiences. Please mail your resume with salary requirements to the address below. 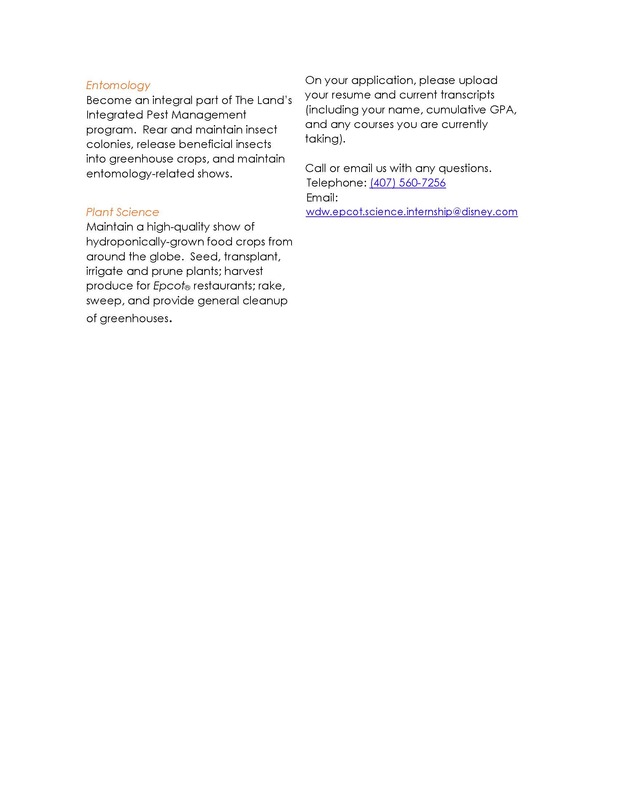 Fax 610.388.5495 or e-mail jobs@longwoodgardens.org. The IPM Intern works in an exciting and diverse work environment. In a given day the intern may scout an indoor/outdoor display or growing area for pests, help manage an aquatic environment, discourage nuisance wildlife pests, rear and release beneficial insects, hang pheromone traps to monitor invasive insect pests, or track growing degree days. The intern will apply the three pillars of IPM: cultural, biological, and chemical control. He or she will use innovative technology to scout for pests, release beneficial insects, perform IPM educational programs for guests, and use various spray equipment to apply chemical pesticide treatments. Additionally the intern will conduct a research project that strengthens Longwood’s IPM program. 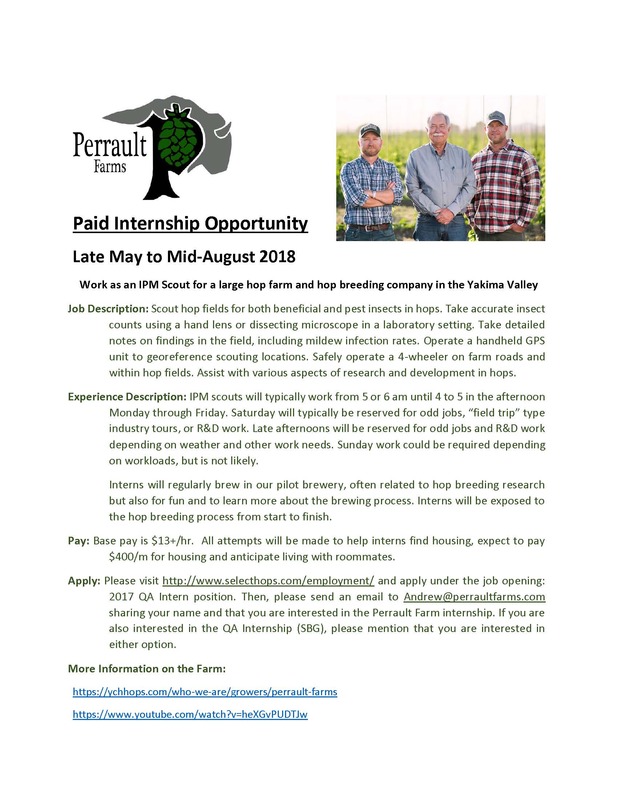 The intern must obtain a pesticide applicator’s license and will apply pesticides with an emphasis on safety, focusing on the least toxic yet effective methods of control. The ability to lift 50 lbs, willingness to work in adverse weather conditions, and a valid driver’s license are required. On a given task he or she may work as part of a team, lead a group of students rotating through IPM, or work independently. This is a 12 month internship. Housing and a stipend are provided. The application deadline is February 1st. Application and program details are found at http://longwoodgardens.org/education/college-and-university-programs/internships-for-us-students.